A Washington Apple Pi Garage Sale Computer Show and Sale is more than just an opportunity to get rid of old computers share the joys of computing with new generations of users. For some, it is a time for searching out hard to find peripherals, or more memory, or a bigger monitor. 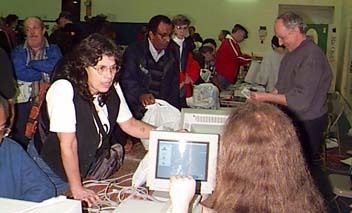 For others, it is a chance to visit the Pi's famous "Computer Checkup" table and see if their machine is in good health. Brighid Brady-de Lambert, Apple User Group Program Manager, sent the Pi a giant Mac OS 8.5 commemorative box for use at our 20th Anniversary Meeting, and "the box" made an appearance at the Computer Sale and Show, too. 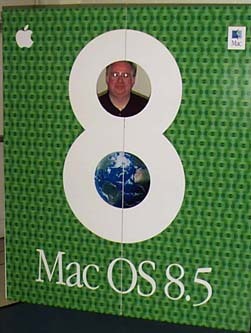 Anyone who wished, and who looked good in green, could appear as a cover girl or cover boy on the Mac OS 8.5 box. To select an enlargement, click on the picture. 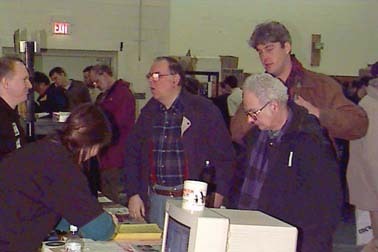 For those interested in computer history, the Computer Show and Sale is an excellent place to indulge yourself. 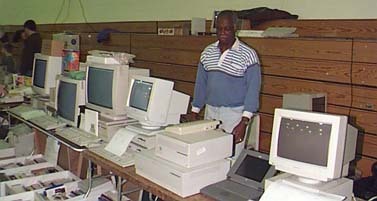 This gentleman, for example, offered a vast array of Macintosh computers, ranging from the first color Mac IIs to the dawn of the Power Macs. 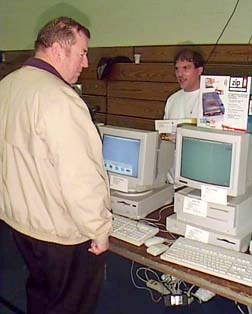 Many of those selling goods were veterans of past computer shows and, in addition to offering anything from components to complete systems, also managed to find some of the original advertising. 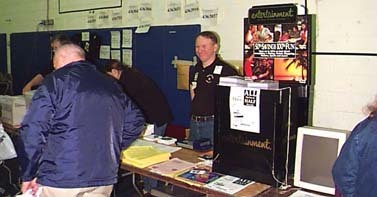 This table, for example, sports one of the original Iomega Zip POP (Point Of Purchase) advertisements. Often, the original shipping containers, in mint condition, were included with the equipment. 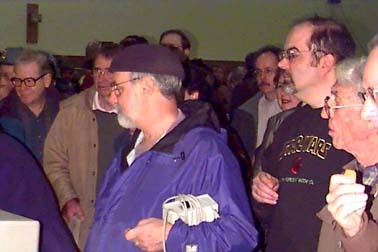 There are many ways to judge the success of an event like this, and if you go by "people in motion," the December 1998 show was a huge success. 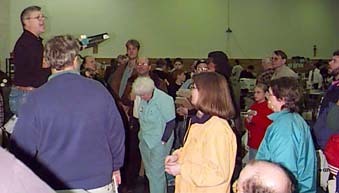 Tom Witte always managed to attract a crowd with periodic drawings for door prizes. His ability to be heard over the noise of the crowd is legendary. 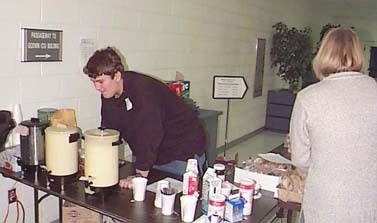 Outside the show hall (which normally is the gymnasium for Northern Virginia Community College in Annandale, VA), David Essick takes a turn at staffing the refreshments stand. Washington Apple Pi had several tables near the entrance. 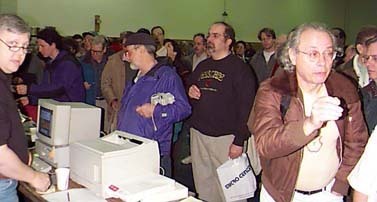 Some of the tables offered software on CD-ROM or diskette, or assisted with new or renewed memberships, or T-shirt and polo shirts, while others were devoted to the famed "Computer Checkup." The tables were always busy, and near the end of the day the volunteers were beginning to suffer from lack of food and drink (neither of which were allowed inside the show).